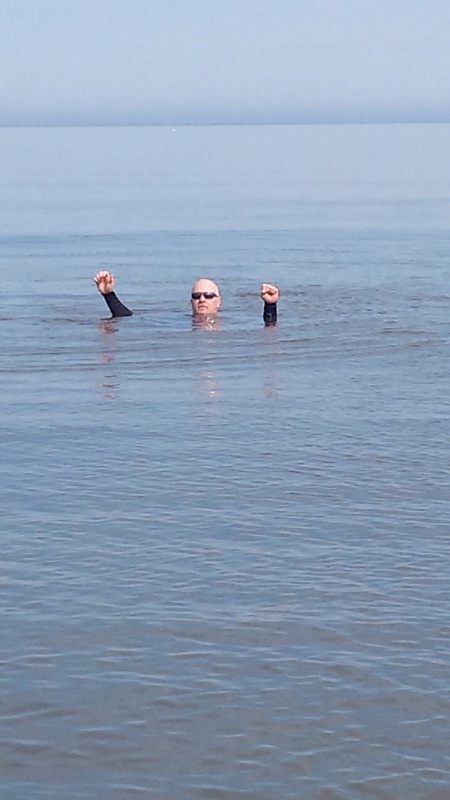 I took my first dip into the St Lawrence estuary this morning. Yes, I was wearing a wetsuit but, feeling game, I put my 3mm instead of the 5mm. The waters, at this time of year, are about 3-4 deg C....That's, like, 37-39 F or so. The Missus tagged along. I love her, she has a lot of guts (or is simply as crazy as I am). I managed to last about 20 minutes. Not bad for my first dip. Another 4 or 5 sessions over the next week; and I should be able to get on my board (but with the 5mm wetsuit instead) and fall in the water without freaking out. You're a braver man than I, sir. Brrrrrrrrrrr. Freeze yer cojones right off! Got cold just looking at the pictures. Good luck with your hobby...brrr. That's great. My wife and I brought our kayaks out of storage and put them down on our dock today. Unfortunately, we don't have enough water in the lake yet. But, since spoonbill season is over, the water should come up soon and we will be kayaking and boating. Enjoy the great outdoors while you can brother! Still too cold for an old man like me. OLD? OLD? Me thinks not! They're still refusing to come back out after the traumatic experience. Yes, same here. Most of the lakes are still frozen up (Matapedia and Témiscouata lakes). Temiscouata lake is an awesome lake for kayaking, paddleboarding, etc.